Southwest Airlines – I think NOT! Remember when it was fun to fly? Really, it was once. Now I feel like a pay a great deal of money for poor service. I normally fly United, where the service is OK, not brilliant , but consistent. Yesterday, for the very first time, I flew Southwest Airlines from Love Field in Dallas. They came recommended so I thought I’d give the airline a try. Never again! I was booked on an evening flight from Dallas to Denver, which was delayed due to storms. No one can predict mother nature, and the storm issue was quite understandable. Not the airlines fault. We boarded the plane 90 minutes late, but that’s OK, a storm is a storm, you have to live with it. However we got on the plane and waited and waited and waited. Around thirty minutes after closing the doors, we were told we were waiting for a box of parts, which needed to go to Denver…… Wait a minute, wasn’t this a passenger flight, why do we have to pay for our seats, but wait for a box of parts before we can take off? The parcel arrived and was loaded on the plane. Yea….lets take off! No such luck! We waited, and waited and waited and…….eventually we were told the pilot had flown too many hours already and couldn’t fly us to Denver…WHAT? Didn’t he know that before we boarded? “We’re going to try to find a new pilot, or re-work the numbers to make the flight shorter”….WHAT? Again we waited, and waited and waited……. Eventually they manipulated the numbers and the flight took off. Instead of arriving home at 10:35 PM, my flight landed at around 1:30. I got home extremely late and my Memorial Day weekend was ruined. Thanks Southwest Airlines! I won’t be using you again. I really couldn’t have covered much more ground in three days. I arrived at DFW Airport on Friday October 2nd at around 1pm. My adventure began with my very first Uber reservation. As I stood outside the airport my phone rang. “Are you dressed in pink?” a strange voice said. Was this a pervert? “No, actually I’m dressed in peach,” I replied hesitantly. “Do you see a Dodge Caravan in front of you?” the voice continued. I looked up and laughed, it was my Uber ride. What guy knows the difference between pink and peach anyway? He delivered me safely to the Marriott City Center. My husband was already there, and still working, so I unpacked and went for a walk. Lovely time of year to be in Dallas! 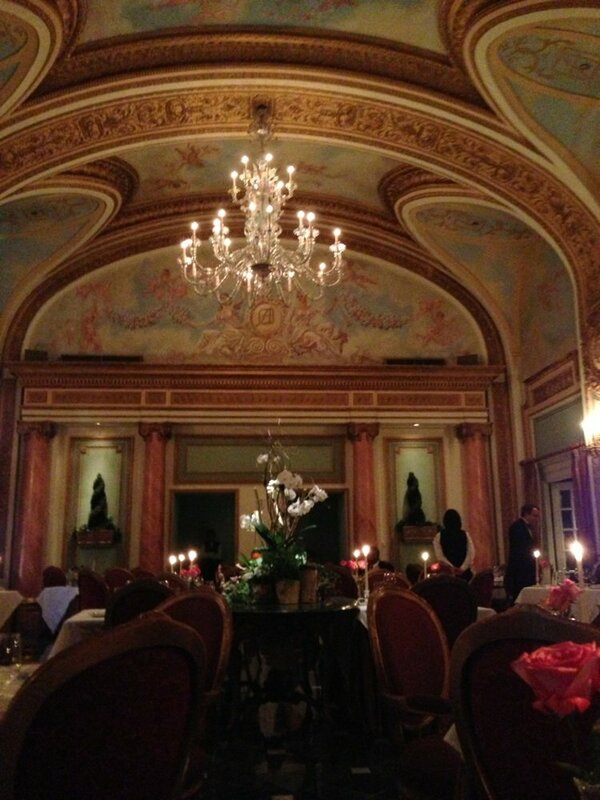 We spent a wonderful, but very expensive evening at the French Room in the Adolphus Hotel, celebrating my daughter’s Birthday. The surroundings, food, service and wine was outstanding. I didn’t take a photo, it would have spoiled the magical atmosphere. We ate the most delicious foods, paired with perfect wine. Expensive, but a fantastic special occasion restaurant. The staff was attentive, but not intrusive. I had the best Grand Mariner Souffle I’ve ever tasted. I’d recommend this restaurant to anyone who appreciates good food. Better even than Antoine’s in New Orleans. Seriously! Saturday was a long fun (and food) filled day. 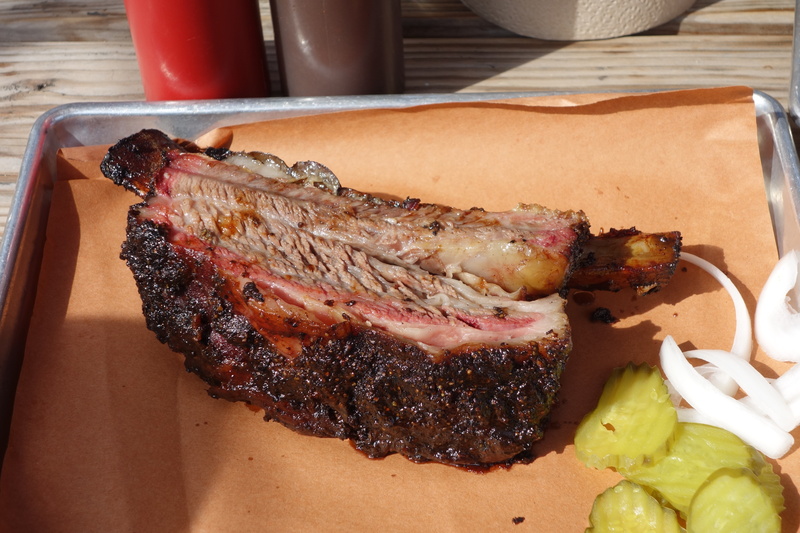 We lined up outside the famous Pecan Lodge to get the best BBQ in Dallas. It was worth lining up for. 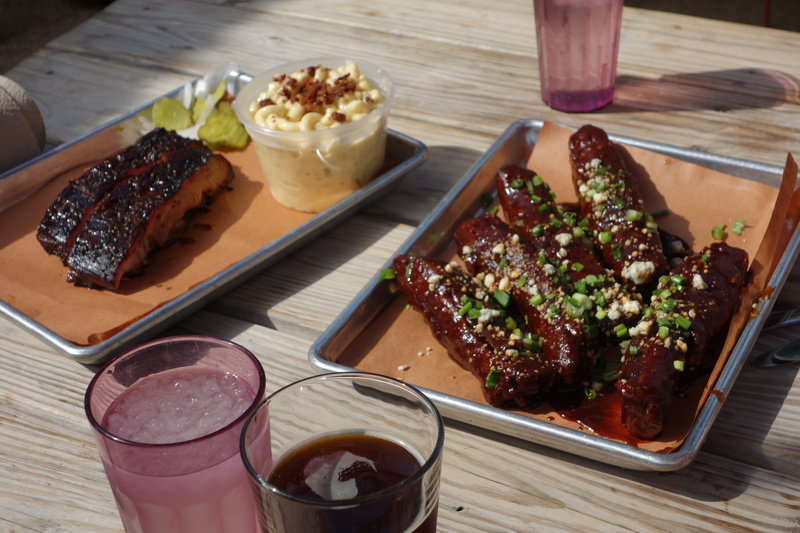 It was too early for me to drink beer, but the rest of my family washed the delightful BBQ down with a good dark ale and then tried to walk off the calories on the Katy Trail. We’d only walked a mile or so, when we found ourselves at the Ice House, where we imbibed in a little more beer, yes me too! More walking found us at a Whole Foods with a bar inside. Imagine that! We shopped and then enjoyed a glass of wine on the Whole Foods Patio. We finished our evening at the movie theater. Black Mass proved that Johnny Depp can still act! Today was another full day! Husband to the airport, daughter and I to Texas State Fair, (after an incident with a film producer in an M6 convertible offering her a job. Seriously). 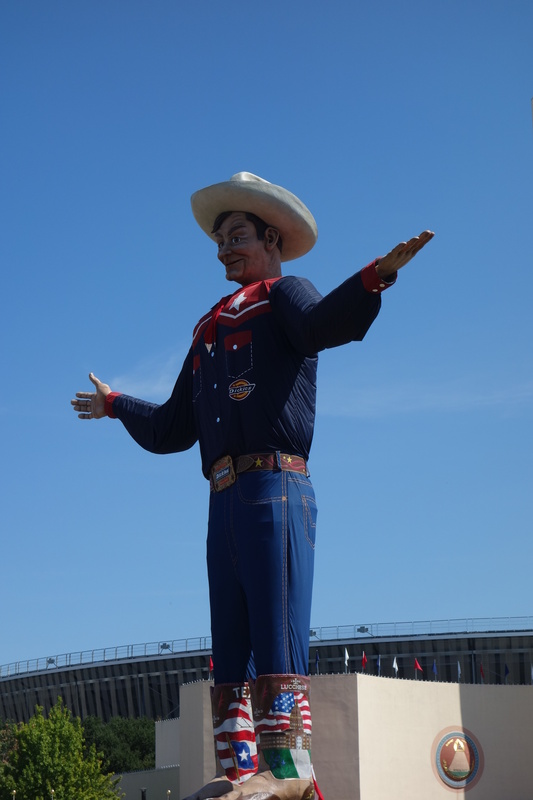 Texas State Fair was everything I expected it would be! Of course everything was deep-fried. We didn’t stay too long, but I’m glad I went. The highlight of the visit was Bacon served on a skewer and fried in honey maple syrup. Delicious. Also jalapeno cheese bites YUM! We sat outside, drank beer and people watched. From the State Fair we went to a Sports Bar, two actually, to watch the Broncos play….thank heavens they won. Now my long weekend in Dallas is over. Sadly I must return home. It’s probably for the best, if I stayed any longer I’d probably gain twenty pounds and need rehab! Dallas Texas – Big Hair, Swank and Shoulder Pads? I’ve lived in the US for over 20 years and became a Citizen back in 2004. Yes, the Queen is missing a subject, wonder if she notices. This country still puts a smile on my face. Our home is Colorado, but we travel as often as possible. Favorite cities in the US? San Francisco and New Orleans! They have both lured me back more than once. I also enjoy Dallas. My first visit was a quick business trip about ten years ago. I stayed in the jazzy Hotel ZaZa and was proudly shown the city by the locals. The Dallas skyline is amazing, especially at night. I returned to Dallas earlier this year, after my daughter’s career caused her to move there. I stayed once more in the Hotel Zaza, still lovely, but unfortunately, due to some badly behaved guests, my visit was spoiled. I’ll not stay there again. Dallas itself was very enjoyable. Great food! My third exploration of Dallas begins Friday. This time I’m staying in the Downtown Marriott. Marriott’s are usually trustworthy! 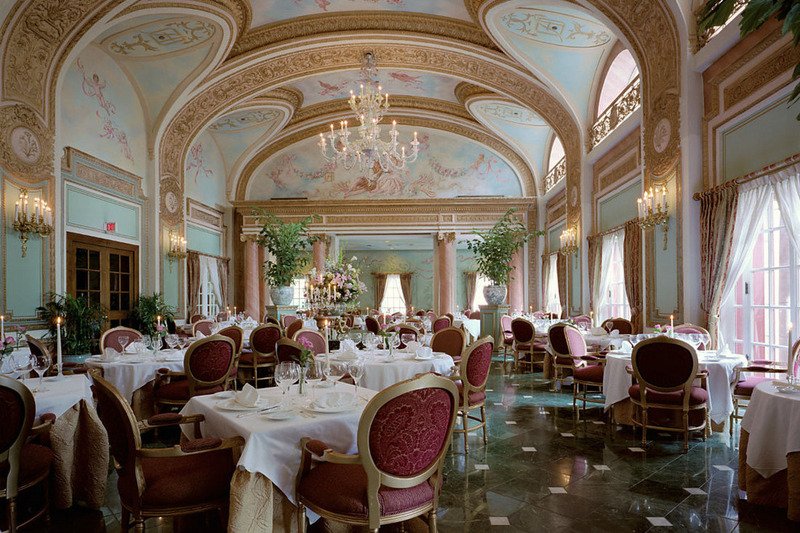 The highlight of my visit (other than seeing my daughter and son in law), will be our meal in The French Room at the Adolphus Hotel, a birthday treat for a young lady turning 31. Yes, that means I’m getting really old. I always thought Dallas was the center of big hair, swank and shoulder pads. The swank is definitely still there, but it’s now a stylish, ritzy city that I’m sure I’ll get to know well. Stay tuned for my report on the French Room! Last weekend I took a trip to Dallas to visit my daughter. Yes she’s flown the nest and has a wonderful job in a new city. Hey Dallas isn’t far from Denver. I’ve only been to there once before on business, and stayed in the beautiful Hotel ZaZa. I was eager to visit it again. It didn’t disappoint! It’s a glamorous boutique hotel. A little different to anywhere I’ve ever stayed. The rooms are large and beautiful, the beds comfortable. Dragonfly (the restaurant/bar) is a wonderful place to linger and serves the best Skinny Rita I’ve ever tasted. Seriously! It was a very busy weekend in Dallas, graduation or something, and I was extremely lucky to get a room. Friday 15th May was my first night in the hotel, and I slept like a log. Saturday came with a delicious healthy kale juice (love my juices ) and cup of coffee for breakfast and then my daughter joined me and we took advantage of the spa. She had a facial with Chantal or Chanel, can’t remember the exact name, but she was so good my daughter may go back regularly. I had a fantastic deep tissue massage from Juan. Excellent! My knots and tension disappeared. I went to bed and edited my upcoming novel for a while, and then read before falling asleep. As I drifted into slumber, I praised the hotel silently for being well sound proofed. None of the noise from the function downstairs reached me. Well done ZaZa……….and then I was awakened by an ear-piercing screech! There was an argument in the hallway close by. I opened my door a crack and peeped out. Without going into details, I can tell you a small group of very pretty young ladies were brawling outside. They were obviously intoxicated because they were barely able to stand. The argument turned into an all out fight, which was comical because as they threw their punches, they were so drunk, they lost their balance. One young girl proceeded to walk along the hallway towards my room, kicking her purse along in front of her and using words I haven’t heard in while. The disagreement continued for two or three hours with doors slamming at the end of each session. ZaZa was in no way to blame for the bad behavior of a small group of very spoiled rude young people, who despite the attempts by ZaZa security to stop them, continued to act like idiots. When I complained to Hotel ZaZa they were very sympathetic, and gave me reasonable credit for the inconvenience. This is a beautiful hotel. All staff members go above and beyond to help you enjoy your stay. They can’t know ahead of time that some guests will unruly and immature, but they did what they could to remedy it. If you go to Dallas, I highly recommend you give this hotel a try. You won’t regret it! If you enjoy a good British (or German) Ghost Story, check out my other blog Stop Talking to Me or my novel Dead of July which is available on Amazon. I can’t remember the year I first visited Hotel ZaZa Texas, but I know i was smitten. The turn down service with belgium chocolates and candles. The fabulous Dragon Fly Bar, the Spa, the atmosphere. Well here I am again, and nothing has changed. Lovely ritzy boutique hotel with great cocktails. My flight didn’t arrive until after six this evening. My daughter picked me up from the airport and then it was a whirlwind of cocktails, dinner conversation and fun. Yes my daughter and her husband live here in Dallas now, so this is the first of many visits. It started well. Feast your eyes on my second visit to Dallas. And its only just begun!